Primary food is the stuff that feeds your soul, but you can’t eat it. And when you don’t have it, you sometimes search for it through consuming actual food. No pepperoni pizza or hot fudge sundae in the world will ever be more than a fleeting substitute for real primary food. Unfortunately, I can not provide you a recipe for primary food; it is something which must be concocted individually. I am making great strides myself, but it’s still not always an easy thing to figure out. In the meantime, we still have to eat actual food, so I will continue to post recipes I’ve been enjoying. Eggplant is one of those vegetables which I love eating but don’t always enjoy preparing. When I saw Mark Bittman’s recipe today for eggplant salad with mustard-miso dressing, I was excited to learn boiling the eggplant is an acceptable alternative to grilling or roasting. The downside to boiling is that it resembles slimy jellyfish. I would definitely grill or roast the eggplant next time, but I wanted to include the directions for boiling, which is a quick, easy, and less hot-in-the-summertime-kitchen alternative. I added edamame for a source of protein, but I think chicken or shrimp would work just as well. Add cubed eggplant to a large pot of salted boiling water for about five minutes or until tender. Drain and cool. In a small bowl, whisk together, onion, cumin, red wine vinegar, sugar, cayenne and olive oil. Toss with cooled eggplant. Gently stir in olives, edamame, and tomatoes. Serve chilled or at room temperature. 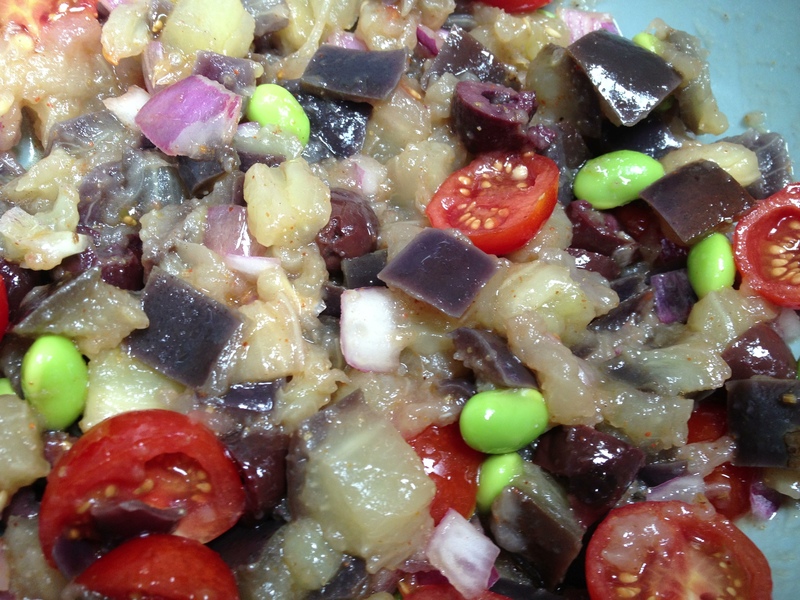 This entry was posted in Salads, Side Dish, Uncategorized and tagged boiled eggplant, eggplant and edamame, eggplant salad by Mom Mom's Apron. Bookmark the permalink. I wondered about boiled eggplant when I read that piece by Mark Bittman. I’m glad you tried it. It makes sense to me that it might be like “slimy jellyfish”. It looks like your salad has some great flavors going on, though.